The first edition 1863 orders are mostly for court martials, organization of commands, etc., but two of the documents deserve special mention. General Order No. 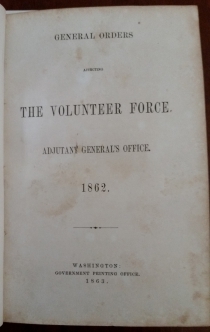 100, April 24, 1863, “Instructions for the Government of Armies of the United States in the Field.” Known as Lieber’s Code, this describes and defines legitimate ends of war and permissible and impermissible means to attain those ends, for instance calling for civilian populations to be treated well so long as they did not resist military authority. It spells out conduct relating to martial law, military jurisdiction, treatment of non-combatants, spies, deserters and prisoners of war, etc. During the Napoleonic Wars, Franz Lieber fought for his native Prussia and was wounded at the Battle of Waterloo. After emigrating to America, he lived and taught in South Carolina for two decades. Two of Lieber’s sons fought for the Union, and another died fighting for the Confederacy. Lieber became known for his scholarship and thinking on rules of warfare necessary to inform and protect soldiers, civilians and commanders. Henry Halleck, who became general-in-chief in July, 1862, solicited Lieber’s views, and then ordered 5000 copies of his report printed. Halleck and Stanton were especially concerned with the treatment of escaped slaves who were forbidden by Federal law from returning or being returned to their former masters, and the introduction of “colored soldiers” into the army after the issuance of the Emancipation Proclamation. They asked Lieber to revise the 1806 Articles of War. Lieber complied, and Lincoln promulgated the rules in April, 1863. “15. Military necessity admits of all direct destruction of life or limb of armed enemies, and of other persons whose destruction is incidentally unavoidable in the armed contests of the war… it allows of all destruction of property, and obstruction of the ways and channels of traffic, travel, or communication, and of all withholding of sustenance or means of life from the enemy; of the appropriation of whatever an enemy’s country affords necessary for the subsistence and safety of the Army, and of such deception as does not involve the breaking of good faith either positively pledged, regarding agreements entered into during the war, or supposed by the modern law of war to exist. (...But...) Men who take up arms against one another in public war do not cease on this account to be moral beings, responsible to one another and to God. The Code provided a blueprint for hundreds of war crimes trials and helped explain the Union’s unpopular decision to cease prisoner exchanges so long as the South refused to exchange black prisoners on equal terms with white ones. It later became the basis for international law promulgated by the Hauge and Geneva Conventions. General Order No. 143, May 22, 1863, established the United States Colored Troops. Orders include the Preliminary Emancipation Proclamation, Gen. Orders No. 139, September 24, 1862 (pp. 118 - 121), as well as two acts of Congress that Lincoln incorporated into the Preliminary Emancipation Proclamation. 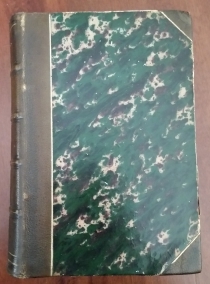 Unlike the complete first editions of the orders from the beginning of 1863 described above, the orders represented here from the first half of 1862 were all reprinted together for the War Department in March of 1863. General Orders No. 27, March 21, 1862, prints the March 14 Act of Congress “to make an additional Article of War,” which Lincoln included in the text of the Preliminary Emancipation Proclamation. Article - All officers or persons in the military or naval service of the United States are prohibited from employing any of the forces under their respective commands for the purpose of returning fugitives from service or labor, who may have escaped from any persons to whom such service or labor is claimed to be due, and any officer who shall be found guilty by a court martial of violating this article shall be dismissed from the service. Sec.2. And be it further enacted, That this act shall take effect from and after its passage. 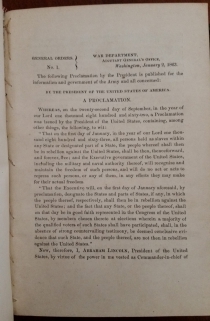 The Preliminary Emancipation Proclamation, General Orders No. 139, War Department, September 24, 1862. Signed in type by Lincoln, Secretary of State William H. Seward, and Adjutant General Lorenzo Thomas. Washington DC: Government Printing Office, [reprinted ca. March,] 1863. “I, ABRAHAM LINCOLN, President of the United States... hereby proclaim and declare that ... the war will be prosecuted for the object of practically restoring the constitutional relation between the United States... That it is my purpose, upon the next meeting of Congress, to again recommend the adoption of a practical measure tending pecuniary aid to the free acceptance or rejection of all Slave States, so called, the people whereof may not then be in rebellion against the United States, and which States may then have voluntarily adopted, or thereafter may voluntarily adopt, immediate or gradual abolishment of slavery within their respective limits; and that the effort to colonize persons of African descent, with their consent, upon this continent or elsewhere … will be continued … That on the first day of January, in the year… one thousand eight hundred and sixty-three, all persons held as slaves within any State or designated part of a State, the people whereof shall then be in rebellion against the United States, shall be then, thenceforward, and forever free …” (G.O. #139, printed in full on pp. 118-121). Very Good. Contemporary half morocco binding, marbled boards with spine in five compartments, gilt lettering spine inscribed to Major N[athan]. S. Brinton, an Army Paymaster. On September 22, 1862, in a Preliminary Emancipation Proclamation, Lincoln warned Southern states that if they did not abandon the war, they would lose their slaves. As he issued the Emancipation Proclamation, which took effect on January 1, 1863, slavery in the United States at last approached its demise. The Emancipation Proclamation was the most important act of Lincoln’s presidency. Its lines reveal the major themes of the Civil War: slavery as the central issue of the war; the courting of border states; Lincoln’s hopes that the rebellious states could somehow be convinced to come back into the Union; Constitutional and popular constraints that made earlier emancipation impossible; the role of black soldiers; America’s place in the world. 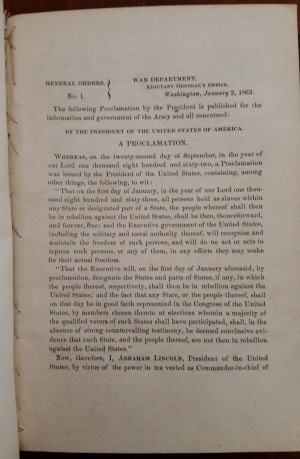 In addition to its moral weight, the Proclamation’s tangible aid to the Union cause was decisive. It deprived the Confederacy of essential labor by giving millions of slaves a reason to escape to Union lines. It encouraged the enlistment of black soldiers. It prevented Europe from supporting the Confederacy. Without the Proclamation, even Union victory itself might not have been the result of the war. “I congratulate you, upon what may be called the greatest event of our nation’s history, if not the greatest event of the century. In the eye of the Constitution, the supreme law of the land, there is not now, and there has not been, since the 1st day of January, a single slave lawfully deprived of Liberty in any of the States now recognized as in Rebellion against the National Government. In all these States Slavery is now in law, as in fact, a system of lawless violence, against which the slave may lawfully defend himself… The change in attitude of the Government is vast and startling. For more than sixty years the Federal Government has been little better than a stupendous engine of Slavery and oppression, through which Slavery has ruled us, as with a rod of iron… Assuming that our Government and people will sustain the President and the Proclamation, we can scarcely conceive of a more complete revolution in the position of a nation… I hail it as the doom of Slavery in all the States…. At last the out-spread wings of the American Eagle afford shelter and protection to men of all colors, all countries and climes, and the long oppressed black man may honorably fall or gloriously flourish under the star-spangled banner.